When the Star Wars Battlefront 2 beta begins next week, you can take a break from blasting strangers online with the newly revealed single-player/local multiplayer Arcade Mode. A post on the PlayStation Blog lays out the first details about Arcade Mode, including the ways the full version will let you tweak your own battles to enjoy on your own or with a friend. 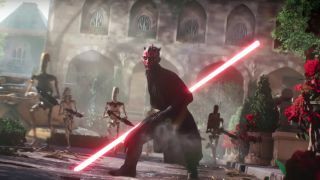 The beta will let players try out two Arcade Mode options on the Theed map (that's the capitol city of Naboo as seen in Star Wars: The Phantom Menace): either a 10v10 team battle populated by you and AI allies/enemies, or one that lets you play as Darth Maul and cut through an onslaught of AI opponents. That's just an amuse-bouche for Arcade Mode in the full version of the game, however. Once Star Wars Battlefront 2 launches in November, you'll be able to configure Arcade battles to your liking: bring in the loadout-tweaking Star Cards you earned from multiplayer, change the AI's trooper classes, tweak the difficulty, pick your preferred Star Wars eras, and so on. There are also pre-made Battle Scenarios that sound like they take the place of the wave-based Missions from the original Star Wars Battlefront. Both kinds of Arcade play support two-player split-screen on consoles, letting you either team up or face off against a local buddy. You'll even earn credits for playing, which lets you buy more loot crates for more Star Cards. Special Arcade Mode challenges will give you the opportunity to earn even more bonuses while playing. My favorite memories of Star Wars Battlefront 2 (2005) are of playing split-screen co-op with my buddy, setting up the maps just right so we could run around and blast Ewoks on Endor (which was surprisingly difficult, since they barely stood taller than the foliage). It warms my heart to think of a new generation of players having that kind of sandbox fun together with the equivalent of a massive, virtual Star Wars toy chest.